In the normal course of life, parents are the primary caretakers of their child. 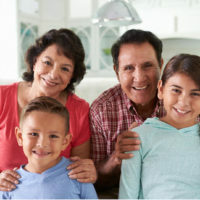 While other family members may assist with childcare, most of the formative information a child receives as part of growing up comes from his/her parents. The law reflects the desire for such an arrangement by focusing child custody matters on the parents, and only granting rights to other adults in extreme situations and for as limited a time as possible. Most parents do everything they can to have an active role in their child’s life, and courts will support this effort by giving parents a strong preference in child custody cases. This means that non-parent adults, who think custody of a child should rest with them, are facing an uphill battle. However, these individuals may be able to win custody rights if the facts of a case dictate such a result is best for the child. An unusual child custody situation out of New York, which illustrates courts are sometimes willing to craft creative solutions in child-related disputes, involves shared custody between one man and two women. Only the man and one of the women were biologically related to the child, but the judge felt the child’s wellbeing required such an arrangement. This outcome is unlikely to be repeated anytime soon, but Florida does permit relatives to hold legal custody in some instances. As noted above, the law views the shared custody between both parents as the arrangement that is inherently best for the child. However, the child’s physical welfare and psychological well-being are always paramount over all other factors. The best interests of the child is the standard all courts must use when making child-based decisions. As a result, courts will rule against granting child custody to a parent if the facts justify such a result. But, because of the strong presumption in favor of parental custody, a relative would need to present compelling evidence that a parent poses a threat to the child’s physical safety or emotional development. Only in cases with well-supported contentions of serious detriment to a child is a court likely to be persuaded to grant custody to a non-parent. the relative is providing full time care for the child, and the child lives with him/her. If parental consent is not forthcoming, the relative must present evidence of child neglect, abuse or abandonment by the parents, and the court must find them to be unfit. However, even if temporary custody is granted to a relative, the parents may still receive visitation if it is in the child’s best interests. Further, either parent can petition for the termination of the temporary custody at any time, reflecting the law’s preference for reuniting child and parent if at all possible. If you have questions about child custody issues, talk to a family law attorney about your situation. Parents have many rights related to their children, but courts may upset this arrangement if necessary to protect the child. The Tampa law firm of Bubley & Bubley, P.A. understands the enormous and vital importance of the parent/child relationship, and will work to obtain the solution that best is for you and your family. Contact us today.